There are many off the shelf range finding components available including ultrasonic, infrared, and even laser rangefinders. All of these devices work well, but in the field of aerial robotics, weight is a primary concern. It is desirable to get as much functionality out of each component that is added to an airframe. Miniature robotic rotorcraft for example can carry about 100g of payload. 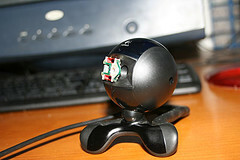 It is possible to perform machine vision tasks such as obstacle identification and avoidance though the use of a webcam (or mini wireless camera interfaced to a computer via USB adaptor). Better yet, two webcams can provide stereo machine vision thus improving obstacle avoidance because depth can be determined. The drawback of this of course is the addition of the weight of a second camera. This page describes how a mini laser pointer can be configured along with a single camera to provide mono-machine vision with range information.